The first item sold on buying and selling platform Carousell was a second-hand Kindle owned by the mobile app’s co-founder. A woman bought it for $75 as a birthday present for her boyfriend. This was in 2012, when the app was being tested by 80 users, and listed 800 items for sale. Now, this has shot up to more than six million items being listed in Singapore. In its early stages, Carousell’s three founders would even visit weekend flea markets to persuade sellers to try out their app, giving out free bottles of water. Said Mr Quek Siu Rui, 27, one of Carousell’s three founders : “People were already buying and selling on existing marketplace platforms and online forums. But these could be frustrating to use. Carousell’s other co-founders are Mr Lucas Ngoo, 26, and Mr Marcus Tan, 31. All three graduated from the National University of Singapore and have done work stints in Silicon Valley. Last January, the number of Singapore listings on Carousell grew to around one million, and these included anything from second-hand hair dryers to handicraft. The popularity of such mobile apps has led to more companies jumping on the bandwagon. Malaysia-based Duriana was launched here in 2013. Tompang was rolled out by a local start-up last year. New entrants this year include Trezo by Singapore Press Holdings digital division, and letgo by an American developer. 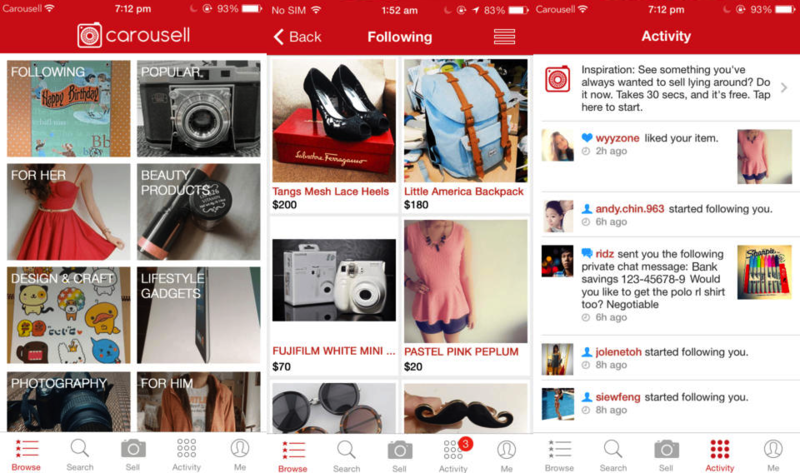 Last month, Singapore-based software developer Garena launched a beta version of its new app Shopee. These marketplace apps tend to be popular with teenagers and those in their 20s, although the number of users aged 30 and above is growing. Fashion and apparel is one of the best-selling categories. Said Mr Jenn Ong, 40, one of the founders of Tompang: “Singapore has a huge mobile penetration rate, and with people constantly on the move, the mobile platform is ideal. These companies expect the number of users and product listings to keep rising. Tompang is expected to grow by 15 per cent to 20 per cent by the end of this year. Carousell, which is also available in Indonesia, Taiwan and Malaysia, will be rolled out to more countries in the next two months. It raised US$6 million (S$8.2 million) in funding from investors last year. Most mobile-commerce apps currently allow users to put up product listings for free. However, they will have to find a way to make money from their operations eventually, said retail experts.